Jasper Fforde’s books are as whimsical as the spelling of his last name. I was first introduced to Fforde over a year ago and mirthfully made my way through his Thursday Next books and Nursery Crime series in a matter of weeks. The fantastical wordplay and literary allusions exercised and entertained my brain (even convincing me to read George Eliot’s Mill on the Floss so I wouldn’t miss out on any of the references). 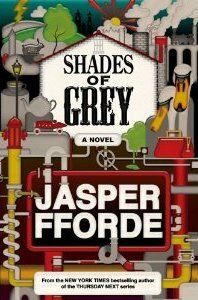 The latest novel by Jasper Fforde is entitled Shades of Grey. Though the name may sound dull, the book is anything but. In the vein of George Orwell or Aldous Huxley, Fforde has created a futuristic dystopia centered around the colors you would find in a little child’s paint box. It is a chromatic universe, and its citizens are divided into a rigid caste system dependent upon the colors they can perceive. The highest position in society is awarded to the Purples, while the Greys toil endlessly as slave laborers in the fields and factories. Eddie Russet, the hero of the novel, has been exiled to the outlands of East Carmine, ostensibly for a prank pulled on a Prefect’s son, but really for his revolutionary ideas on how to improve queuing. The Collective, as we come to find out, is firmly opposed to change. In the Great Leap Backward, the Head Office has already banned much of the technology devised by the “Previous.” Citizens use telegraph machines instead of the illegal telephones, and only a few old Fords have been exempted from destruction. Eddie’s father, who accompanies him to East Carmine, is a swatchman. As a medical professional, his job is to cure patients by showing them the correct swatch of color. The only illness which cannot be cured is the dreaded Mildew. Patients who show symptoms of this disease are euthanized quietly in the Green Room before an outbreak of the spores can depopulate the entire region. Engaged on a half-promise to marry Constance Oxblood (the daughter of a rich string manufacturer) Eddie wants nothing more than to finish out his punishment and return to the city of Jade-under-Lime. But when he encounters a rude and recalcitrant Grey named Jane (with a very cute nose), he begins to learn some unpleasant truths that the Head Office would rather keep under wraps. Mysteries, murder, and carnivorous yataveo trees abound in this page-turning Ffuturistic Ffantasy. Shades of Grey is the first in an intended trilogy. Hurry up, Mr. Fforde! I’m waiting for the next installment.